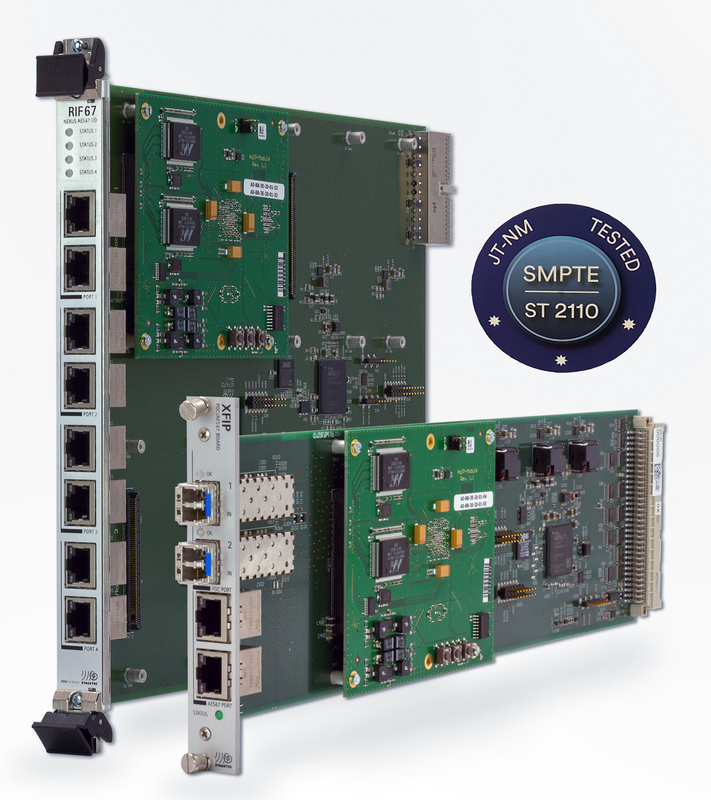 Stage Tec's NEXUS AoIP interfaces XFIP/RIF67 have received the label "SMPTE ST 2110 JT-NM Tested"
Las Vegas, USA, April 2019: Stage Tec, the Berlin-based manufacturer of professional audio technology, has received the label "SMPTE ST 2110 JT-NM Tested" for its XFIP/RIF67 NEXUS products at NAB. The JT-NM Tested program documents the extent to which products implement the ST2110 standard. The results were presented at the NAB IP showcase. Stage Tec participated in the ST2110-30 audio test and the ST2022-7 test with its XFIP/RIF67 NEXUS products. The catalogue with the description of the full test procedures, the results and the participant list can be downloaded here: http://jt-nm.org/jt-nm_tested/. "Stage Tec's participation in the JT-NM Tested program was a complete success," sums up René Harder, member of the Stage Tec management team responsible for innovation management. "The use of IP is becoming increasingly important in the industry. The need to ensure interoperability between devices from different manufacturers is therefore growing. The independent test results make a significant contribution to providing users with guidance. Users can make a better assessment of how our products can be used for applications in combination with ST2010 components". The Joint Task Force on Networked Media (JT-NM) was the organiser of the test procedures, which took place in Houston in March. The tests were carried out by the EBU and IRT (Institut für Rundfunktechnik GmbH / Institute for Broadcasting Technology). JT-NM promotes the development of interoperable IP technologies for professional media through standardized test procedures. JT-NM is supported by the European Broadcasting Union (EBU), the Society of Motion Picture and Television Engineers (SMPTE) and the Video Services Forum (VSF).